If a force is applied to one side of a diaphragm and an air pressure is applied to the other side, some particular value of pressure will be necessary to exactly balance the force. This pressure is proportional to the applied force. A corrugated diaphragm with its top surface attached with arrangements to apply force. An air supply regulator, nozzle and a pressure gauge arranged as shown in figure. A flapper arranged above the nozzle as shown in figure. The force to be measured is applied to the top side of the diaphragm. Due to this force, the diaphragm deflects and causes the flapper to shut-off the nozzle opening.Now an air supply is provided at the bottom of the diaphragm. As the flapper closes the nozzle opening, a back pressure results underneath the diagram. This back pressure acts on the diaphragm producing an upward force. Air pressure is regulated until the diaphragm returns to the pre-loaded position which is indicated by air which comes out of the nozzle. At this stage, the corresponding pressure indicated by the pressure gauge becomes a measure of the applied force when calibrated. 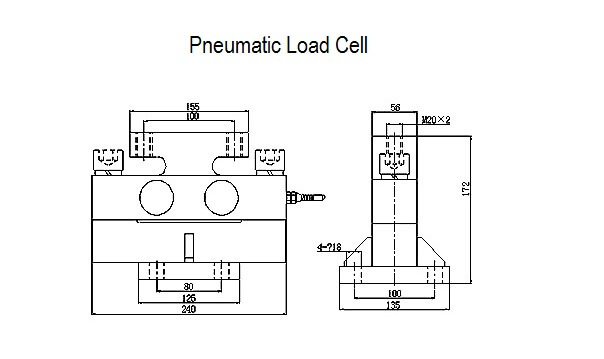 The pneumatic load cell can measure loads upto 2.5*10^3 Kgf. The accuracy of this system is 0.5 percent of the full scale. What is Flapper Nozzle System ? What is HVAC System ?